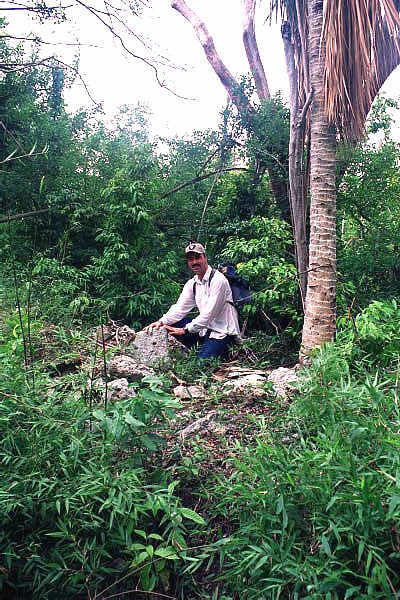 The Maya Site at Basil Jones, known as Bercellon is relatively unknown and unexplored. 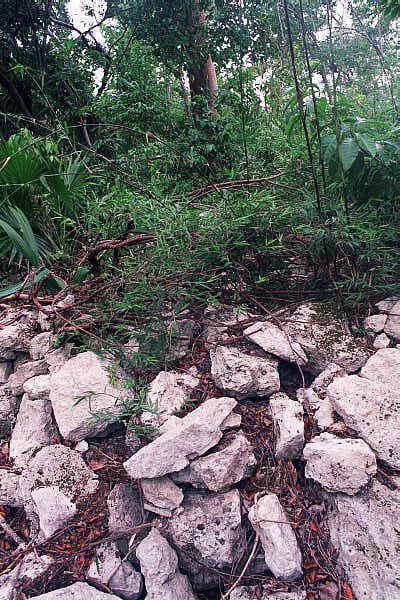 Surrounded by jungle and completely over grown, Bercellon is one of the last potentially major Maya sites on Ambergris Caye, yet to be explored. One of the things that attracted me to Belize was the Maya Civilization and their many temples. Then after becoming a future resident of the Basil Jones area of Ambergris Caye, I became quite interested in the Maya Site at Bercellon, not too far away. There was very little known about it, so when I visited the island in August, 2001, I was determined to find out more and explore it. 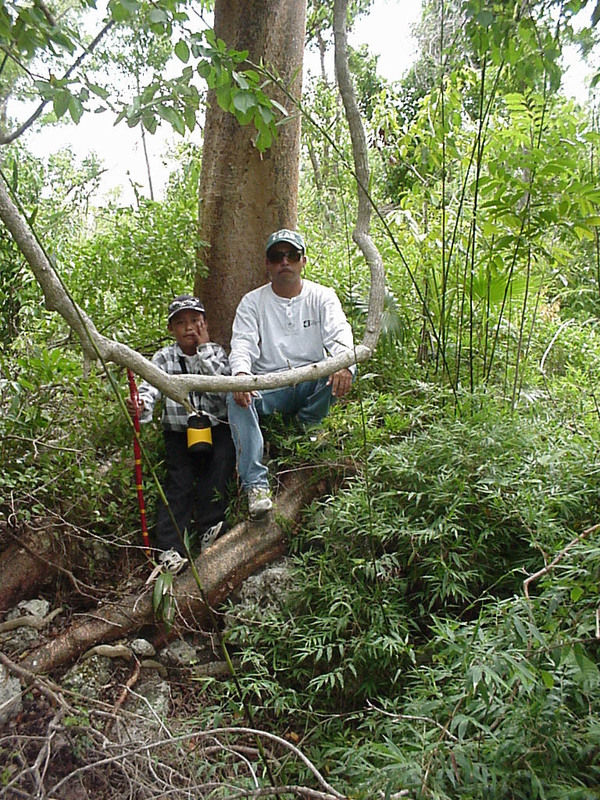 This is a narrative of my expedition (trip) to the Bercellon Maya Site. After asking around San Pedro, I eventually was put in touch with Secundino "Dino" Gonzalez Jr. and his friend Samuel "Sam" Gonzalez. 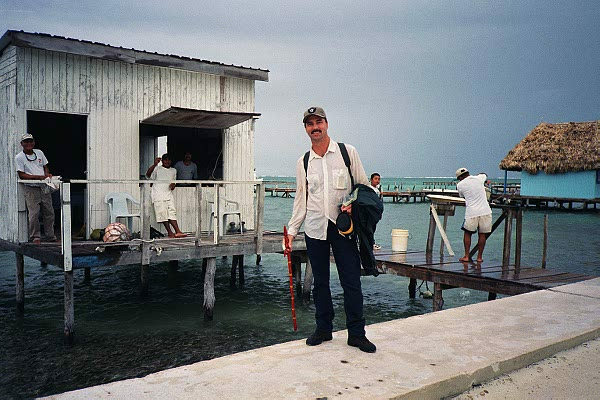 Dino had been to Bercellon, a couple of times, but Sam was a hunter and often hunted for deer and wild pigs on North Ambergris Caye, especially the Basil Jones area, and Sam knew just where the Bercellon ruins were. 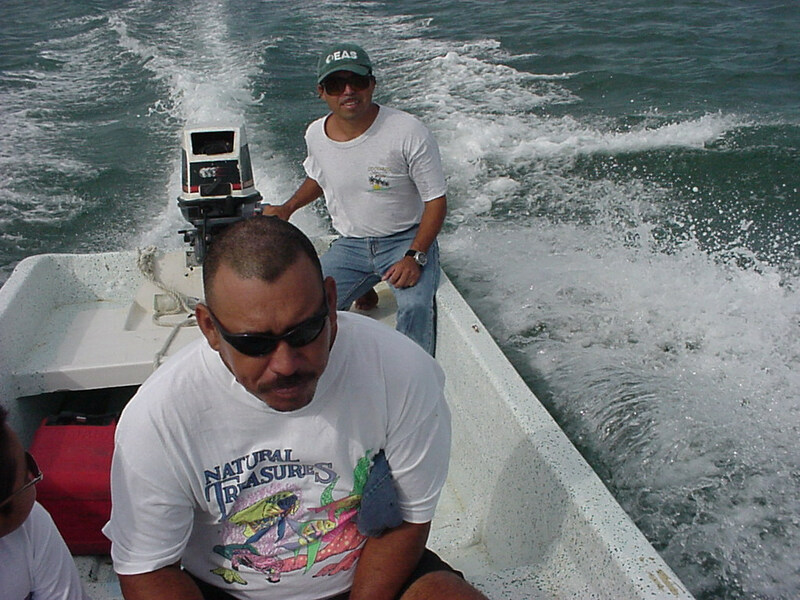 Arrangements were made and with an over cast sky I found myself boating up to North Ambergris Caye, with Dino, Sam, and a friend of Dino's, ten year old Guillermo "Guininni" Burgos. Dino had warned me to be prepared for mosquitoes, so I wore a long sleeve shirt and long pants and brought two types of repellent. I also brought two cameras, some plastic ziplock bags, just in case of rain, and a one hundred foot tape measure. The trip north took about fifty minutes until we docked at the newer Nova Shrimp concrete pier, by the road to the Basil Jones airstrip. From there we headed west down the one and one quarter mile sand and crushed coral road. The walk down the road was pretty unremarkable, but it is wide and well maintained. After about a mile and a quarter we came into a clearing from which you could see the 1,800 foot Basil Jones airstrip, a wide buffer zone of mowed grass is maintained by Nova Shrimp. 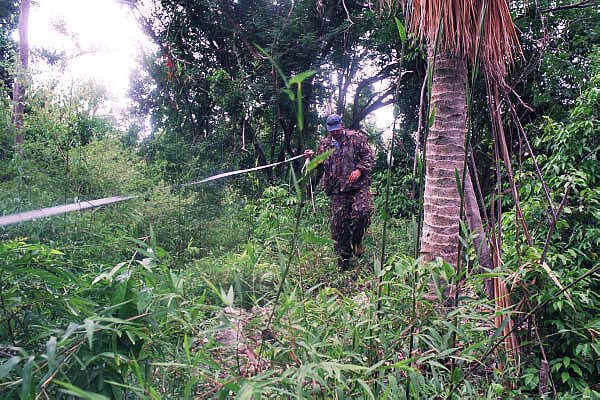 Before we got to the actual airstrip we cut off the road to the south and walked across the buffer zone and Sam found the mostly disguised entrance to a trail into the subtropical forest or jungle. When I say trail I mean that in the loosest terms, an animal or pig trail is more of what it is, at best. By the time we were a few feet in the forest, we were completely soaked from the humidity and the mosquitoes were all about, but I had put Deet repellent on my clothes and Citronella on my face. Take it from me the Citronella doesn't work and they were swarming all around my face, I couldn't get the Deet out and applied fast enough, and had multiple bites on my face and hands, by the time I sprayed it on. The trail was lined with small trees and a variety of unusual plants and foliage, many of which could inflict pain or discomfort, we also kept our sunglasses on to protect our eyes from whipping branches. I'm not sure just how far we traveled, but in about fifteen minutes we came to a small cave. The cave is only a few feet deep and about ten plus feet wide, in a fairly low area and was quite damp. 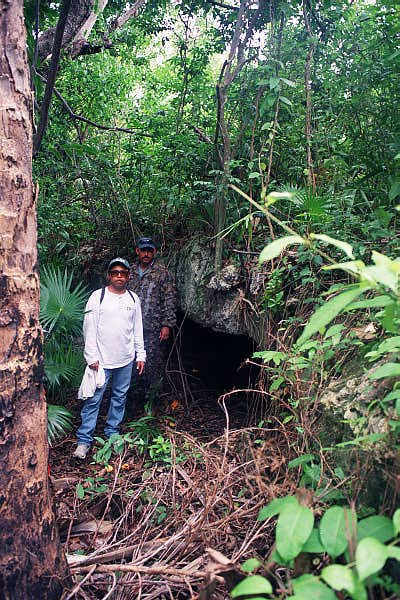 It is probable that the Maya utilized the cave, maybe for water. From the cave we traveled another ten or fifteen minutes losing the trail once or twice until we found the site. As we struggled to keep on the trail, we almost didn't see the ruins, they just spring up out of the jungle. The mound is made of of hand hewn limestone rocks and is completely surrounded and over grown with underbrush and trees. 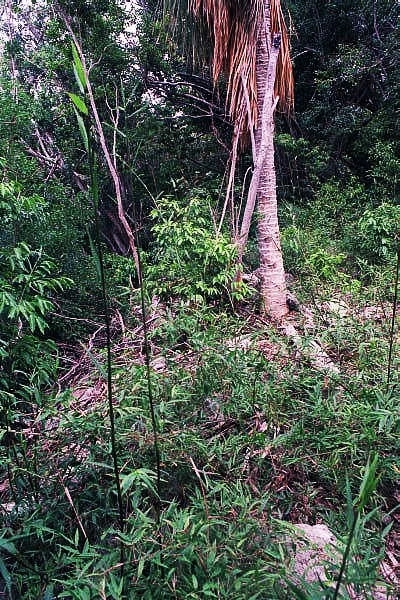 It is hard to get a view of it from more than a few feet away, the jungle just swallows it up. We climbed up on top of the mound and pushed through the dense growth trying to see the scope of the temple. We had to watch out not to fall into the numerous holes dug by looters down into the mound. Eventually we were able to find the edges of the temple. 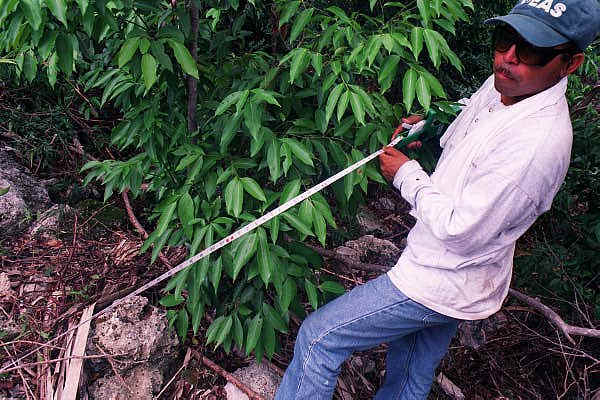 From there we measured the mound, it was fifty-eight by fifty-five feet on the top level, assuming that the jungle and soil had covered up the base level. The height was at least six feet but we assumed that another couple of feet were below the ground. The limestone rocks are completely loose, just a stack or pile of rocks, all the original limestone based mortar, used in construction, having long since crumbled and washed away. 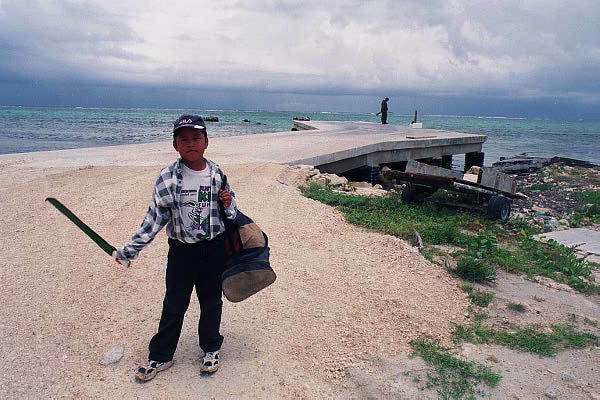 The site to be better seen and explored needs to be cleared and excavated then its relationship to Ambergris Caye may be better understood. 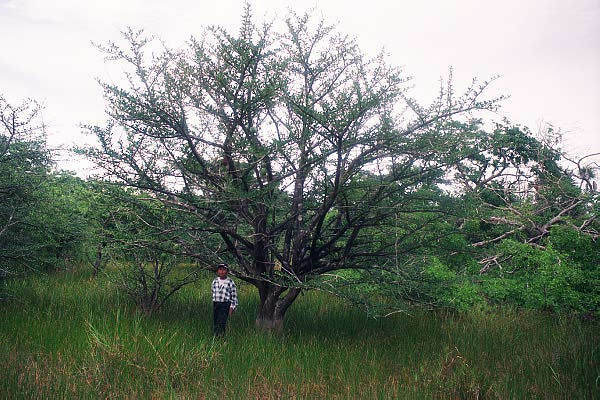 From Bercellon we back tracked to the airstrip, then we walked west to the end of the airstrip and continued west into marshy jungle, Sam had brought his sixteen gauge shot gun and knew a watering hole where we might see a pig or deer. We didn't, but along the way we passed a tree with what appeared to be broken Ostrich sized eggs strewn underneath it. I looked around for the creatures that came from the eggs before noticing that they actually came from the tree which is known for its gourd like fruit. When we got to the watering hole there were no game animals, but if I had thought there were a lot of mosquitoes before, there were ten times as many here. Even Dino got out his mosquito mask and I noticed mosquitoes covering everyone's back as we were walking back out, to the airstrip. Walking a little slower than when we went in, we made it back to the Nova pier having been away over three and a half hours, and now the sky was threatening to bust loose on us. I tucked my cameras inside the baggies and we hunkered down in the bottom of the boat as the rain poured down on us, all the way back. It stopped just as we got back to San Pedro. The trip or expedition to Bercellon was long, hot, wet and strenuous and the ruins are just that - ruins. 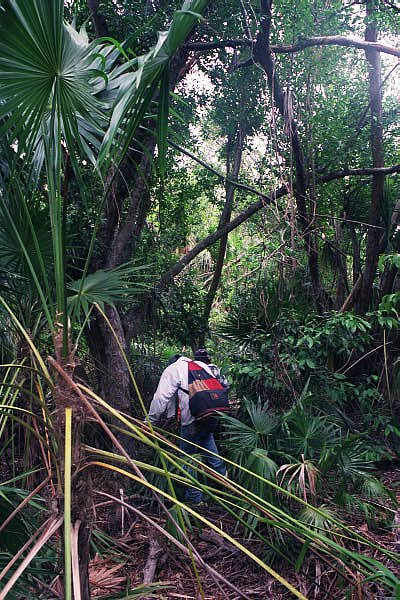 But still amongst the jungle and limestone you could sense the Maya's spiritual presence and it was worth the visit. But in order for Bercellon to be better understood and protected, the site is in desperate need of clearing, maybe then further exploration can be done. Also a trail into it from the airstrip will need to be made.